Sneko x Ashe Fandub~ <3 Ashe's voice is beautiful. The video, although tiring, was quite fun to make. Oh, and if it wasn't already obvious, this is me and Ashe singing with our voices. Hello guys. Sneko here. Um. Wow. Finally some luck with blogs. I tried one on wordpress and can't say I liked it all too much because of it's complexity. That and I'm just plain dumb. 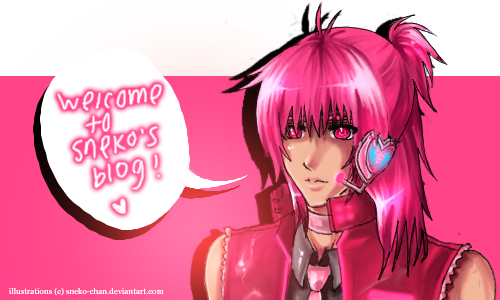 This here blog's where I'll dump all my UTAUloid/Vocaloid stuff a.k.a where I'll whore out Kotone. That means an updates from his youtube channel, new UTAU songs, updates on his voice bank, covers, and well, just about anything else relating to my UTAU.